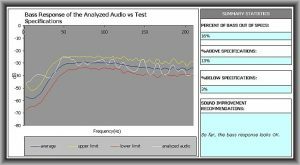 AudioSpectro FIRE (Flat and Intelligent Response Equalization) is a tool that can be used to solve problems involving frequency balance in audio mastering process. This works by comparing the mix with a test specification data gathered from industry-standard/broadcast quality mixes/masters. 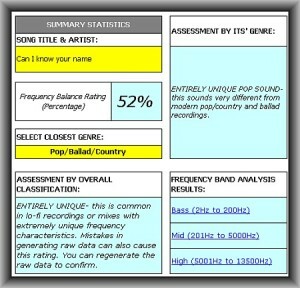 It provides an easy to understand rating system and recommends objective EQ tweaks based on the analysis. The objective is to attain a flat equalization response (“frequency balance”) that makes your mix comparable to the sound of today’s modern mixes. b.) 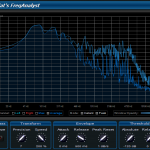 Getting the right bass level in audio mastering. Not only bass but mid and high audio frequency as well. 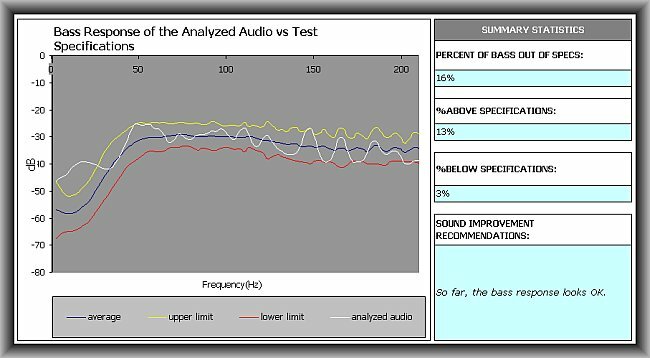 c.) A powerful confirmation tool in your DIY audio mastering. Of course, this is not designed to substitute poor listening skills but think of this as your “ears” training partner in sculpting your mix audio frequency response to perfection. After that, you could also download the audio demo and analysis files (Right click- then save as. Size: 237MB) used in this tutorial. Unzip it and use it as a guide. This is only used for practice and learning purposes on using this software. But don’t use the spreadsheet analysis provided by the demo files as it is not using the latest version. You need to use the latest version of this tool (version 1.4) in your own practice and evaluation. Note: The WAV files in the demo are in 32-bit float/44.1KHz format because they are recorded in Adobe Audition 1.5 some years ago that uses 32-bit float as an equivalent bit depth of 24-bits. Read more about this equivalence in this tutorial. First; I play the raw mix down audio file (Refer to High Resolution WAV Files– > CanIknowYourName-BEFORE EQ.wav in the demo files); a few rounds on my studio monitors to check for problematic frequencies while monitoring at average volume. a.) The track lacks mid-frequency “presence” compared to the bass. 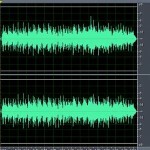 Lack of presence is a common problem for tracks before mastering. However this aspect is particularly important for pop/ballad and country genre type. b.) It also lacks brightness in the audio high-frequency range. This makes the bass sounds more dominant in the overall mix while drowning the mid to high audio frequency response. In other words, the frequency balance is not good. Before I start implementing some EQ settings; I need to confirm these problems using AudioSpectro Fire to get some objective view of the problem. AudioSpectro FIRE need some data input about the track. This data needs to be generated using Audacity and TT Dynamic range meter software, for procedure refers to the sheet named as “APPENDIX A. Generate RAW Data” in the tool. After generating the RAW data of the mix down (Refer to Raw data generated — > raw data- BEFORE EQ.txt in demo files), the analysis can now be started. I paste the data on “STEP 1.) 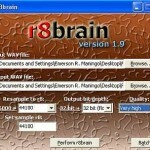 Raw Data” and the software automatically validate the input data. 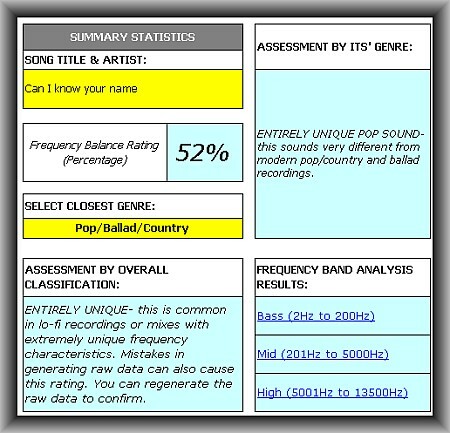 It shows a frequency balance rating of 52% which is very far from the normal scores ideally starting at 80% above (For details about the rating system, please read “Frequency Balance Rating Guide” sheet in the tool). This implies some issues pertaining to the overall frequency balance. 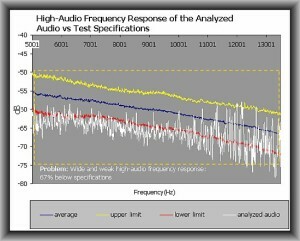 It shows that the analyzed audio (track I’m working on) is within the bass specification limits of targeted response. Although there are points that exceed specifications, the overall response is still OK and normal. There is nothing to tweak on this frequency range. 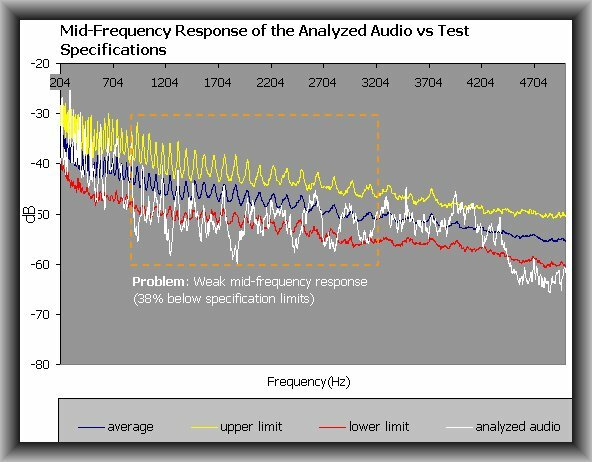 It says 36% of mid-frequency response falls below specifications. I specifically highlighted the majority of the problematic sections in dotted orange box. This is somewhere around 800Hz to 3200Hz. 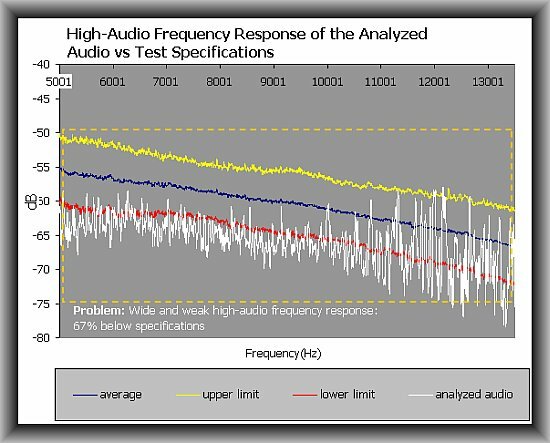 There is wide and weak high-audio frequency response just what I’ve suspected before doing the analysis (during the listening session). 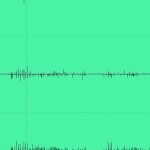 The problem is wide; starting at 5000Hz all the way to 13000Hz. Following the workflow (see “Appendix D. Workflow” sheet in the tool); it does not need re-recording or remixing because I think these EQ issues can be resolve in audio mastering. The analyzed audio frequency response does not deviate very far from the specification limits so some EQ adjustment can fix this.